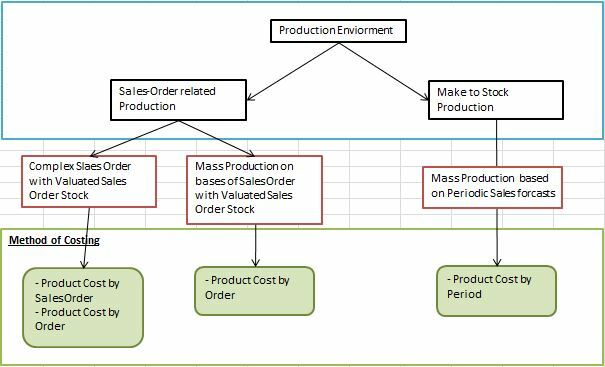 Product Costing is the one of the core responsibility of the Controlling Department in any manufacturing concerns which varies from business to business depending on nature of its Product and Production. 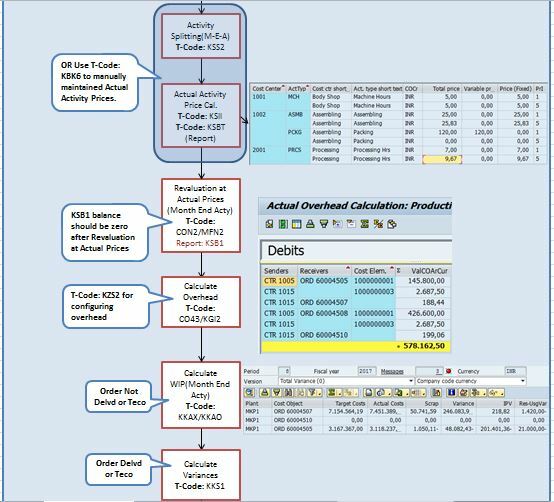 Its supports the organization in making loads of strategic decision along with other functional areas.Gaining some expertise of SAP Product Costing over the past few years, this is my attempt to provide the overview of SAP product costing process. In the below scenario, we have procure RM1 from two different Vendors at 50:50 ratio. While RM2 is procure from only one Vendor. Required quantity of Raw Materials should be procured (as shown above) or available in stock. In our scenario we are using Collective orders With Automatic Goods Movements. i-e; if we create Production order for FERT Material the Production Orders for its semi-Finished good (HALB) gets automatically created. 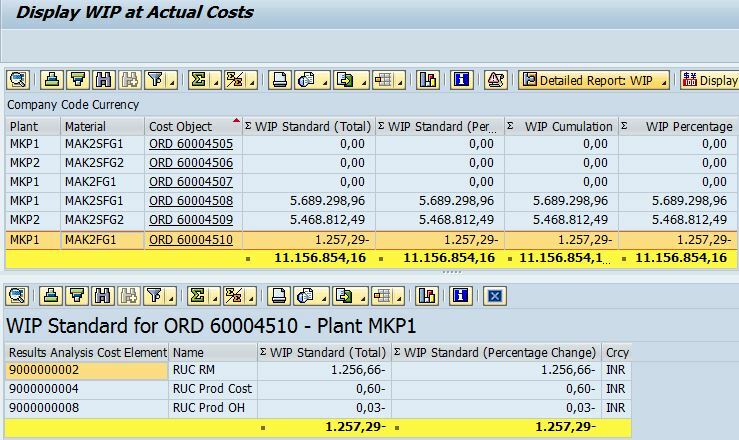 To Create a collective order, one of the SFGs must have a special procurement key 81 in its MRP/Costing view of master data. 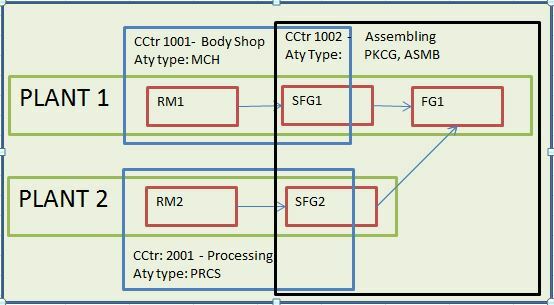 After creating Production Order we perform Good Issue for RMs and SFGs in respective orders, we do this separately through MIGO (movt type: 261) or using MB1A or during confirmation of activities CO11N which is our next step, as shown in figure below. As in our scenario, we will execute two Production Orders using the below Production process, for quantity 150 & 450. Now, we post Actual Costs/Expenses incurred on the Production Cost centers 1001, 2001 and 1002 during the month using t-code F-02. You need to calculate Actual activity Price, by using t-Code KSS2 ‘Activity Splitting’ and KSII ‘Actual Activity Price Calculation’ or you can enter it manually through t-code KBK6. 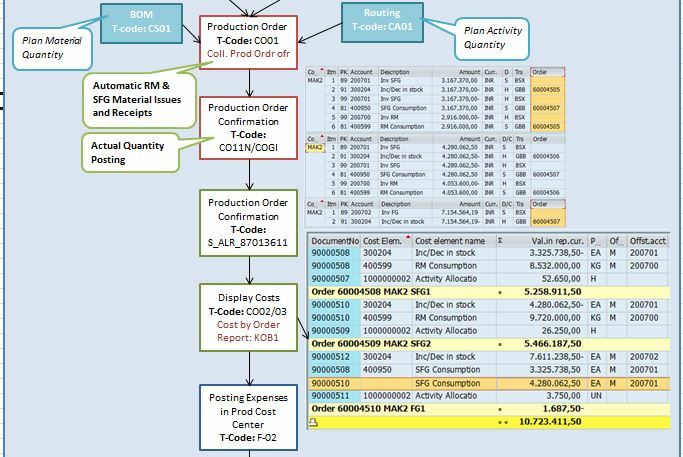 Now, you do Revaluation of Activities posted to Production Order at Actual Price by using t-code CON2/ MFN2. 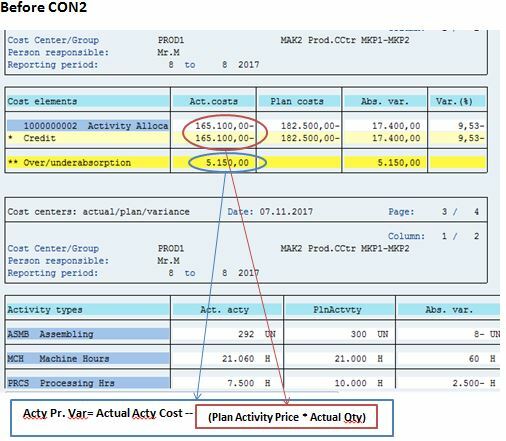 Note: You don’t need to perform this step if you have activated Actual costing /Material Ledger and have selected ‘2’ = Update is active and relevant to price determination. 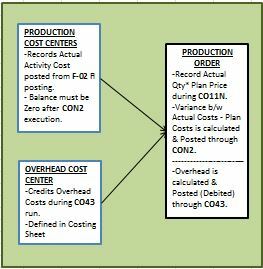 As a result of which, Plan/actual variances of cost center are debited to the material instead of charging to Production variance when calculating actual prices of activities during Single –Level Price determination in Actual Costing run. 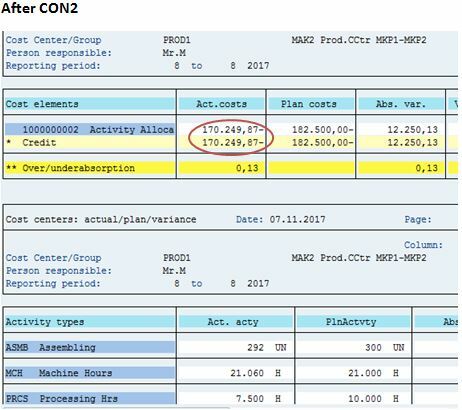 Below are the screenshots for production cost centers report S_ALR_87013611 for analysis, before and after executing CON2. Now, we ran the t-code CO43 to calculate overhead based on costing sheet. As a result of this transaction overhead amount calculated is credited to overhead cost center and debited to Production order. Now, to calculate Work in Progress we run t-code KKAO, as result of this WIP for partially delivered orders (whose status is not TECO or DLV) is calculated but not posted to Finance. 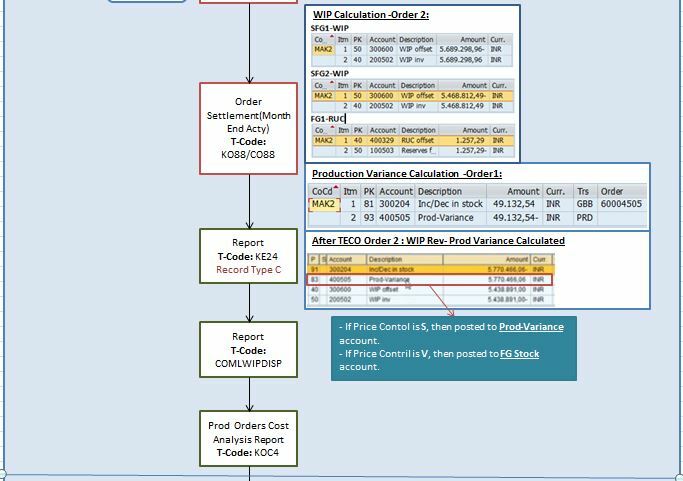 After calculating WIP and Variances, now the time comes to record them in Financial Accounting by settling Production order through t-code: CO88/ KO88. 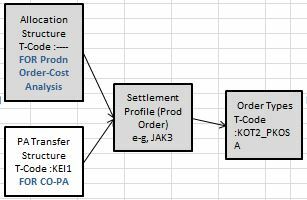 As a result of this transaction, along with accounting documents the CO-PA settlement for variance also took place resulting in generation of CO-PA documents with record type C.
T-Code: KE24 – Display Actual Line Items: CO-PA – to analyze the Variances settled to CO-PA.
T-Code: KOC4 – Production Order Report – Actual/Plan/Target/ Variance, to analyze costs posted on production orders. 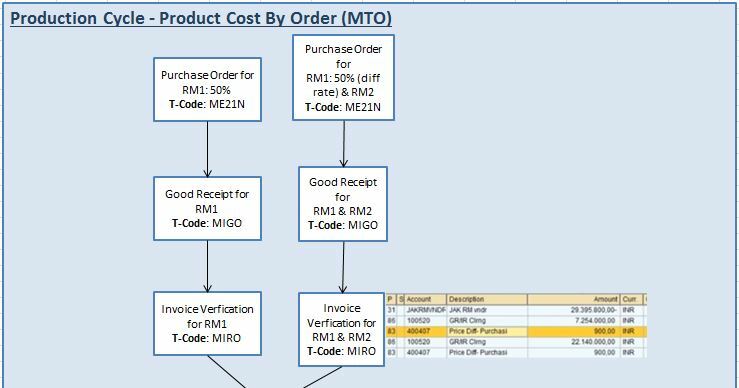 This blog provides mere overview of Product Cost by Order process. In the next blog I will discuss the Product Cost by Period Cycle. Till then readers are requested to keep patience and don’t forget to provide feedback for this post.